I think I may have discovered the perfect nap device: My cat, Walter. Hear me out–I’m serious about this. Ever since I started working from home 5+ years ago, one of the wonderful perks is if I really need a nap, I can take one. The problem, however, is that short naps leave me feeling really groggy. Instead, my standard nap cycle to wake up feeling refreshed is 2 hours. Yep, 2 hours. That’s a long nap. While it feels great, it’s 2 hours of lost productivity, and I find it difficult to fall asleep at a regular time afterwards. That’s where Walter comes in. 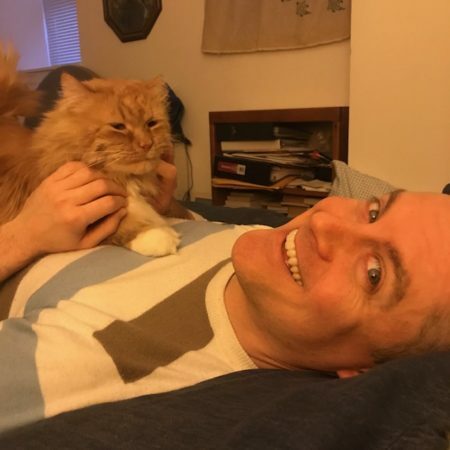 You see, on an almost daily basis, Walter politely requests what I call “tummy time.” He leads me to the bedroom, waits until I lay on my back, and he climbs on my chest. He proceeds to purr and drool until something surprises him, at which point he jumps off and does his own thing. Sometimes tummy time lasts just 5 minutes or so. But Walter typically takes his time, and as a result, I often fall asleep. But here’s the thing: When I wake up, even though it’s only been about 20 minutes, I feel completely refreshed. Today I realized why. The reason is that when I’m about to enter a deep sleep cycle, I do a full-body jerk. It’s a major convulsion, big enough for girlfriends to comment on. I mentioned that Walter ends tummy time whenever he’s surprised. So what I realized is happening is that I fall slightly asleep and then–before I go past the point of no return–I convulse, sending Walter scrambling, which wakes me up from my slumber. Without his noticeable retreat, I’d keep sleeping for another 2 hours. Walter is the future of naps! Have you found the perfect nap length for yourself (and how to achieve it)? What is your “Walter”? This entry was posted on Monday, March 25th, 2019 at 8:16 pm	and is filed under personal and tagged with personal. You can follow any responses to this entry through the RSS 2.0 feed. Haha, nice job Walter! You both look quite content in that photo; well, him in a slightly different way. I feel a 2-hour nap is just about perfect, as well, but I wish much less would suffice. I have 2 senior dogs that are not-at-all Walter in this respect and would probably be happy napping for much longer!